This three/four day trek is ideal for average walkers as the altitude does not go over 3,400 meters (11,155 feet) and trek passes through several villages on its meandering route through the Bumthang countryside. This trek provides an exceptional opportunity for contact with Bhutanese rural life. The four valleys of Bumthang, is revered by the Bhutanese as the sacred land of Bhutan with many important Nyingmapa saints coming from here including the famous Pema Lingpa, the great treasure reveler of Bhutan. Day 01: Arrive Bhutan from Bangkok, Kathmandu or Delhi. Hotel. Day 02: Full day sightseeing in Thimphu. Hotel. Day 03: Drive Thimphu to Trongsa. Hotel. Day 04: Drive Trongsa to Bumthang. Hotel. Day 05: Full day sightseeing of Bumthang valley. Hotel. Day 06: Start trek to Nanglakhang. Camp. Day 07: Continue trek to Medow Camp. Camp. Day 08: Meadow Camp to Ugyen Choling. Drive to Jakar. Hotel. Day 09: Drive Bumthang to Pukakha. Hotel. Day 10: Drive to Thimphu and Paro. Hotel. Day 11: Paro sightseeing and hike to Taksang. Hotel. 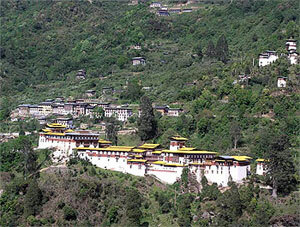 Day 12: Depart Bhutan for Bangkok, Kathmandu or Delhi. Information and photographs of this website are copyrighted materials. © 2008 Adventure Geo Treks. All Right Reserved.